Bird's-foot (Lotus Corniculatus) other names : Bird's-foot , Trefoil. 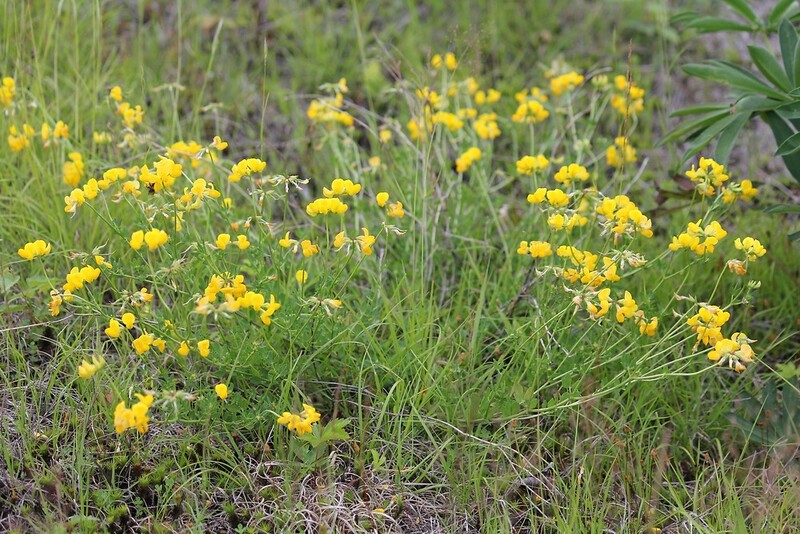 The bird's foot trefoil is native to Europe, and was introduced into North America during the colonial period. The herb can now be found growing in the wild locally from Newfoundland all the way south to Virginia, in the west in Ohio and Minnesota, and in north-eastern Texas as well as along the Pacific Coast in the extreme west. The herb commonly called the bird's foot is a many stemmed perennial herb, bird's foot can reach from six to twenty four inches in height and is a low lying herb. Each leaf of the bird's foot is divided into five smaller leaflets; the leaflets in the upper part resemble a clover, while the lower two leaves form a pair at the basal region along each leaf stalk. From June to September, numerous small and yellow to orange colored flower heads form clusters at the ends of the long stalks and these eventually produce slender seedpods that all end in a peculiar hornlike tip. The hooked tip is to encourage dispersion of the seedpods by animals. A number of plants are named for the Greek word “lotos”; these plants include the legendary shrub bearing fruits that were induced happy indolence in people who consumed them - the fruits eaten by the mythological lotus eaters of ancient Greek tales. The Latinized species name corniculatus that can be translated as “horned" is an allusion to the slender curved tips found on the floral buds of the herb, as these resemble tiny horns. 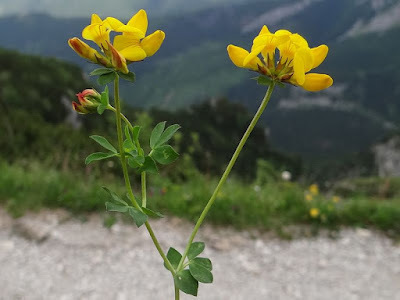 The common name "bird's foot" is a reference to the slender seedpods which look like a bird's foot or talons, and the word "trefoil" is an allusion to the resemblance of this plant to the red clover, which is also known as the “trefoil” plant. Bird's foot has been associated with possessing several medicinal properties. These properties were discovered in by the French herbalist Henri Leclerc in the 19th century. Leclerc suggested eyewash made from the sweet clover to a country woman for the treatment of conjunctivitis who in addition, suffered from a nervous condition that induced sleeplessness and heart palpitations in herb. The distraught country woman made a tea of bird's foot mistaking it for sweet clover and drank the tea. One result of this mistake was that the nervous problems afflicting are reportedly vanished within a week. Leclerc immediately studied the properties of the bird's foot and began to use the herb to treat patients with nervous disorders. The bird's foot is used as a fodder and forage plant in North America to this day and it may have been brought over exactly for this purpose early in colonial times. Cotton and woolen fabrics manufactured in North America were once dyed using blue and yellow dyes obtained from the leaves and the flowering tops of the bird's foot herb. The flowers are stated as being good for bee keepers and an excellent honey is obtained from apiaries where bird's foot is the flower of choice. Ideal growth sites for the bird's foot are well-drained soils in areas with good exposure to sunlight. The herb does not grow well in shaded sites. The bird's foot also grows well on poor soils. The herb serves as an important source of the caterpillars of many insects. The bird's foot is preferred by bees, the flowers of the herb provide an important source of nectar for bees in many wild areas in Europe and North America. The bird's foot flowers have a very powerful fragrance, however, the flowers can self-pollinate if required. Bird's foot can spread out in a site as it grows very freely at the roots and clusters of the plant can be expected at any particular site. Certain types of soil bacteria have a beneficial symbiotic relationship with this plant species. These soil bacteria form nodules on the roots of the plant and fix atmospheric nitrogen - thus aiding the plant in obtaining this precious nutrient. 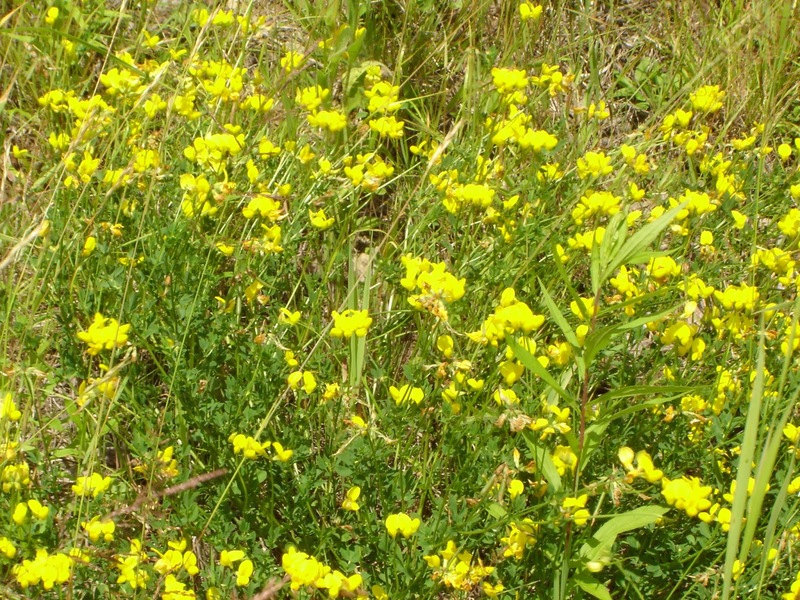 The growing plant utilizes some of this nitrogen, however, some of the fixed nitrogen is also utilized by other plants that growing near the herb. This perennial herb is highly vulnerable to plant parasites like root-knot nematode (Meloidogyne spp.) and root-lesion nematode (Pratylenchus penetrans). In addition, there are some more pests that may affect the seed crops adversely, for instance alfalfa plant bug (Adelphocoris lincolaris) and mirids (Lygus lineolaris), but these may be dealt with by using common pesticides. The seed yield of bird’s foot is also reduced by seed chalcids (also known as Bruchophagus platypterus) and this can only be taken care of by harvesting the plants quite early and also burning the remains of the plants after the harvesting is over. Doing this helps to diminish the population of seed chalcids. In agriculture, bird’s foot is generally grown in the form of a forage plant - mainly for hay, pasture and silage. Scientists have developed a number of cultivars that grow quite tall for this purpose. In places where the soil condition is not fertile, bird’s foot may be grown as a substitute for alfalfa. In some places in Northern America as well as in Australia, this plant has turned out to be invasive spices. One variety of bird’s foot bears double flowers and is cultivated in the form of an ornamental plant. In addition, the bird’s foot plant is a vital source of nectar for several insects and many Lepidoptera species like Six-spot Burnet which use this plant a source of larval food. In Europe, florists often use the blooms of bird’s foot in wildflower mixes. The trefoil of fresh bird’s foot plants encloses cyanogenic glycosides. When macerated, these cyanogenic glycosides yield little quantities of hydrogen cyanide. However, usually this is not toxic for humans, because the dosage is very small and our body can metabolize cyanide comparatively rapidly. In addition, Lotus Corniculatus also contains condensed tannins and these are said to enhance the assimilation of proteins in the small intestine. The bird’s foot plant can be effectively used in the form of a tranquilizer. As far as the language of flowers is concerned, the bird’s foot is among the rare plants whose blooms have a negative implication, as they are a symbol of revenge or vengeance. The bird’s foot plant contains toxic substances called cyanogenic glycosides (also known as hydrogen cyanide) and hence the entire plant is poisonous. However, when used in small amounts, hydrogen cyanide helps to promote respiration as well as enhance digestion. In addition, it is also said to be helpful in treating cancer. When used in large amounts, hydrogen cyanide may result in the failure of the respiratory system, sometimes even causing death. For cyanogenic glycosides, this single-celled plant is polymorphic (having a number of adult forms). Flowers of a number of forms of bird’s foot enclose very little quantities of prussic acid and hence the plants may turn to be toxic while they are in blossom. However, after the plants are dried, they become totally harmless.